It's precisely a new experience for the invitees that I imagine is being suggested in the excerpts ACD quotes. What happens after that new experience remains to be seen. If the newbies become members of the "core audience," whatever that means (Have they heard 112 recordings of Mahler 9? Can place Wagner's anti-Semitism in a historical context? What? ), it will be wonderful. But if they start attending two or three concerts a year, it'll be beneficial, too. As for the last line, "I would suggest to Mr. Geelhoed that in future he focus more on the concept, and less on the terms used to describe it," I'll start doing that as soon as words stop having specific meanings which are then used to describe concepts. No one reads between the lines as much as I do (ask my exes), but if ACD can show me which words connote and imply—and this is entirely by connotation and implication, since the phrase he's using is not there—that building a "core audience" is the goal here, I'll take it all back. And really, this whole discussion is idle tiddly-winks, so this is all I'm going to write about it. 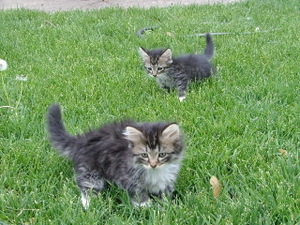 As a reward for reading all of this, here's a picture of cute kitties. Maybe I've missed something in A.C. Douglas' ongoing snit about Take a Friend to the Orchestra and the iPod generation(s), but I haven't found anywhere on Drew McManus' blog anything about building the "core audience," as A.C. calls it. The idea of TAFTO was to bring in new people who haven't gone to an orchestral concert before and see if they like it and maybe give them some tools to help. I wrote one of those essays myself. This differentiation between lay audiences and experts reminds me of an experience in graduate school when I was reading something by Curt Sachs or Paul Henry Lang, one or another of those old-school musicologists. He fretted about the man next to him in the concert hall being unaware of the manifold mysteries and charms of Mozart's handling of sonata form and pitying him for not being able to appreciate it the way he did himself. It turned my stomach. The core audience will take care of itself, so long as orchestras don't do anything to upset it to the point that it decides to leave. Such projects would probably include having Andrea Bocelli in town repeatedly, laser-light shows and having conductors talk endlessly before conducting, by which I mean for more than seven minutes. (Though there are conductors who can talk brilliantly for much longer than that.) Building that core audience is a worthy goal, but it's not the goal of TAFTO, at least the way I interpret it. If we read those TAFTO essays as ways of bringing in new listeners who could become occasional audience-members, then we've done our job. To do that, you've got to reach them where they are and not expect them to become experts in sonata allegro form beforehand. Maybe they'll become part of the "core audience," but as long as they're in a seat and enjoying themselves, it's good enough for me. Five students of the Indiana University Jacobs School of Music died over the weekend in a plane crash outside Bloomington. Here is the AP article and here is the article from the Indiana Daily Student. The IDS link includes obituaries of the five students. A young girl died while I was enrolled there, and the outpouring of support for her large family made that enormous school feel much smaller and intimate. I imagine something similar is happening there now, and wish for all that I'm worth that it didn't have to. Sir Francis Bacon wrote the Brandenburg Concertos! Stop the presses! Linked via ArtsJournal, this authoritative story from The Telegraph explains that Anna Magdalena Bach wrote J.S. Bach's Six Cello Suites. We can now add Bach to the list of artists whose works may have been written by someone else. I've never heard of this scholar Martin Jarvis who teaches at Australia's Charles Darwin University, and the scholars recruited to support his theory don't ring any bells, either. Jarvis is quoted in the article saying that he discovered that "...the original manuscript in the hand of Johann Sebastian had vanished." This is not news. This has been known for a long time. Stephen Rose of Royal Holloway, University of London backs up the line of thinking on these works that's found in Christoph Wolff's Bach: The Learned Musician. Anna Magadalena may have copied some of these works, but she probably didn't write them. "Yet regardless of the fragmentary transmission, and even limiting our focus to the collections for which dated (or dateable) original sources have survived, the Coethen works as a group are strikingly consistent in their high quality and common purpose," he wrote. The Cello Suites likely precede Coethen and the original hasn't surfaced, but still, there's no doubt in his mind, at least from this biography, that they were written by Bach. That is fiction, ladies and gentlemen, and a tad melodramatic. This is reality, reality which bears a resemblance to some fictions, and I know exactly what M. Camus is talking about. Your friendly neighborhood music journalist will return shortly, having wallowed in Keith Jarrett, Billie Holiday, Johnny Cash and Emmylou Harris. And Mozart's slow movements from the piano concertos. Can't forget them. And perhaps L'Amour de loin, if I think I can handle it. Go read Alex Ross on Kaija, why don't you? I don't know Matias Tarnopolsky's salary. Tarnopolsky does work for the New York Philharmonic. I do not have a wife. Krystian Zimerman played a recital in Chicago, as did Yuja Wang. The New World symphony was recently played here, as well. I do know Annie Tomlin. Susannah Phillips has sung here previously. George Benjamin wrote Dance Figures. "Kranke mond" is part of Pierrot Lunaire. There are no analyses of Chopin on this blog. Much has been overheard in Chicago. Daniel Barenboim is giving the BBC Reith lectures this year. Deceptively simple means that something may appear simple, but be profound, possibly. A boy soprano once sang the Queen of the Night aria. I didn't know Mark well, but he always had a smile for me and everyone else when walking the halls at Time Out. It's taken me all this time to realize how rare that is in an office environment. He was our Comedy and Sports editor until his death last Friday from a brain aneurysm suffered the week before. Mark was an avid biker and I often saw him cycling around Hyde Park, where he and I were the only Time Out staffers to call that South Side neighborhood home. The eight mile-ride from Hyde Park to Time Out's Loop offices held no surprises for him. He and his girlfriend looked forward to her finishing graduate school at the U. of C. so they could move to the north side, where it would be easier for him to attend comedy shows. Everyone was always surprised, in the early days of Time Out, to hear that we had one person who covered both of his sections. They would then ask if there were any other strange combinations handled by one person. There wasn't, and there wasn't anyone like Mark, either. Mark's Tribune obituary is here (once you register); his obituary from the Sun-Times is here; and the appreciation by Jonathan Messinger, Time Out's Books editor, is here. Jonathan's piece is especially touching. Mark was 34. I'm taking a week or two break from blogging. Sometimes life isn't deceptively simple, and is actually pretty difficult. Keep up with the writers to the right and I'll be back soon. Promise. Tonight marks the final concert of the Callisto Ensemble, and it's a doozy with the Ligeti Horn Trio. Ursula Oppens is on piano and the huge-toned Gail Williams is playing horn, neither of whom are members of the ensemble, but the violinist, Stefan Hersh, takes care of that little detail. Back in January, I interviewed Oppens about the trio. Listening to it and going through the score, I thought that they obsessive way Ligeti repeats the downward chromatic scale was supposed to be funny. Why else would he just keep hammering out the same pattern? Oppens didn't think so, but laughed off any disagreement and said, "I think it's about the saddest music ever played." At the January concert, which I mysteriously didn't blog, she won me over to her point of view. It is sad, it is dark, it's the work of a composer who's life has been thrown upside down at some point and he is now coming to terms with it through art and reaching into the composers' toolbox of available grief-representing forms. A big sentementalist myself, I anticipate a similar experience tonight. On this gray and overcast day here in Chicago, the last thing that's on your mind is taking a friend to the orchestra, probably. Maybe that's just me. But the enterprising Drew McManus and his blog Adaptistration think otherwise, and with good reason, and you should go there now to read my contribution to the cause. And take a friend to the orchestra this month!